NEW YORK —“I had a peg leg and was in a brace for eleven months,” she told us. 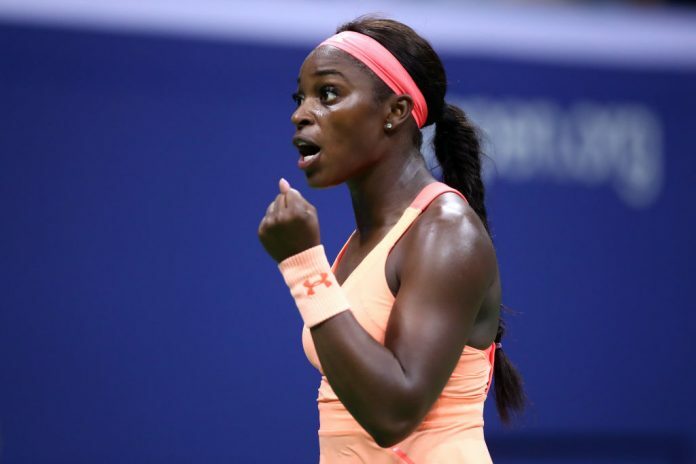 Early this summer, Sloane Stephens’ ranking had dipped to No. 934. Her defeat of Serena Williams en route to the 2013 Australian Open semis was but a distant memory. For months, she hung out with her family. She couldn’t run until last May. She promptly lost her first two matches when she returned. She was worried – will my shots come back, will my speed return? But she knew she had fight. Then, she started to win. She reached the semis in Toronto and Cincy and, amazingly, the unseeded Californian swept to the US Open semis. But in the press room, seasoned reporters gathered and asked: does she really have championship mettle? Memories remained of Stephens having a ‘tude, a sense of entitlement. With young Sloane there was no shortage of swagger or sense of self-worth. She relished seeing herself on billboards and in magazine spreads. Then there was the time she got into a spat with Serena – it’s best not to do that. Well, now, Sloane is poised to win what, along with Wimbledon, is the biggest title in our game. After all, time heals and life teaches. Being away from your trade, your way of life, and your passion is inevitably a major reality check. Sloane had a core realization: “Playing tennis is an amazing thing – and I’m lucky that I’m able to play a sport for a living. I really love playing…It was eye-opening. I loved my time off, but when I got back to playing, it was where I wanted to be. Tonight was a time to see Sloane’s clean shots, her quicksilver speed, her dazzling defensive skills and her grit. She sprinted to a 6-1 first set win over Venus in just 24 minutes. Was Venus tired from playing two tough three-setters in a row? Was it the pressure of trying to reach her third final of the season, or was it that she was playing a much younger American? Who knows? But Sloane knew one thing. She was playing Venus Williams, and the beloved elder of woman’s tennis wasn’t about to throw in the towel. Instead, Venus began to hit out, and unleashed groundies deep to the corners as she won the second set, 6-0. Williams had the momentum. And Venus, the woman who tells us that championships aren’t given to you, that you have to go out and grab them, was grabbing the match. And boy, did she. Despite a barrage of Williams blasts, Stephens sprinted, counter-punched and made life completely miserable for “our leader,” as Sloane described her. Williams had to run corner to corner. It turned out that “bounce-back-ability” – Sloane’s favorite concept these days – came into play big-time. Never mind that Hawk-Eye gave Venus a big favor. Forget that Venus came within just two points of victory. Stephens didn’t panic. Instead, she rebuffed Williams’ considerable punches. Sprint and scamper – here was astounding defensive brilliance at its best. Plus, Sloane out-dueled her foe in clever cat-and-mouse points. Her inventive flicks and spontaneous shots of wonder (including a deft “lob thingy,” as she described it) wore down the 37-year-old. Venus had no more punches. Sloane’s soft hands, fine forehand and effortless speed – which sometimes seems so nonchalant – prevailed, 6-1, 0-6, 7-5. Just 33 days ago, the 24-year-old Californian was ranked No. 934. Now she’s headed to the US Open final, where she’ll face Madison Keys. So what has been the key to Sloane’s meteoric turnaround? Speaking of coming back, American tennis is back (if it ever went away). We don’t know who will win Saturday. We just know it will be an American.